I was in so much pain that I didn’t want anyone to touch it. But I was reassured and am so thankful for it. I had instant relief. I couldn’t believe the way I could move after the adjustment. Now, it did take some time to fully heal, but I was able to return to doing stuff much faster than if I just did nothing or took pills. 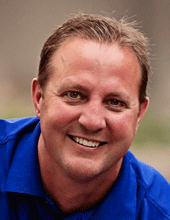 I was introduced to chiropractic by my brother, Tony, who is a chiropractor in Sacramento, CA. As I described above, I was in a water skiing accident in 1994 and a motorcycle accident in 1997. I tried traditional approaches to resolve my lower back pain and it wasn’t until I visited a chiropractor that I got relief. I was bare-footing on a boom off of my brother’s boat in Northern California when it happened. I was getting pretty good and then I caught a toe and flipped down and hit the water with my chest and face. The impact blew open my wetsuit and felt like it forced my eye’s out of my head. The boat was going about 40-45 mph so it was quite an impact. When I came up to the surface I had a terrible pain that felt like my lower back was on fire. I had been folded over backwards so the bones jammed and put a tremendous amount of pressure on the nerve. I floated in the water for a while thinking how much it hurt, and when the boat circled around it was hard for me to imagine getting out of the water and climbing up onto the boat. I was able to get up and walk after about 15 minutes of pain, but it continued. That afternoon I went to see a chiropractor (my brother) and he was able to get me off the table and walk without pain for that afternoon. I was able to return to work and did not miss any time due to the injury. I was adjusted daily for a week then 3 times per week, then 2, then once per week. Each time it felt better and better. I was able to play golf, volleyball, basketball, even go skiing again quickly thanks to chiropractic. This experience inspired me to become a chiropractor. I wanted to help those like my chiropractor did for me. I want people to return to their activities sooner, rather than waiting for a long time for the pain to go away. I went to Marquette University in Milwaukee, WI. I chose that school because I was interested in going into a health care field and they had an excellent pre-med program, as well as one of the best Physical therapy programs in the nation. As I went through the program, I became interested in Psychology and decided to make that my major. After getting my degree I still had aspirations to go onto further school but was undecided. I took some classes at the University of Wisconsin, Madison and decided to enroll at Northwestern Health Sciences University. While in chiropractic school, I was surprised by the core curriculum and the difficult class schedule. I was in classes for 8 hours a day and then had to study and find some time to work and exercise. The schedule was grueling for the first 3 years like that and definitely took it’s toll on me. But it was also the best of times. I was doing terrific in my classes and then had to take the National Boards exam. This is when you put all your classes into four examinations evaluating your knowledge of Anatomy, Physiology, biochemistry, organic chemistry, nutrition, clinical procedures, histology, pathology, GIGU, infectious diseases, Methods, neuromusculoskeletal system, endocrinology, gynecology E.E.N.T., Radiology, Pediatrics, Dermatology, Obstetrics, just to name a few. This was the most challenging examination in my life, but with my training at Northwestern, it was not that difficult. I know I have the knowledge it takes to best serve my patients. My vision of chiropractic is a vitalistic approach, that says the whole is greater than the sum of all its parts. A healthy body is a self healing and self regulating organism that is controlled by the nervous system. When this is interfered with the result is sickness, disease and pain. Chiropractic is the removal of this interference so to release that nerve energy and allow people to fully express their potential. I work with patients to discover the problems of health and disease from a structural point of view with special consideration given to spinal mechanics and neurological relations. My patients vary in age range from the very young, a few days old, to the aged. I love to work with all ranges and find each group to have their own challenges and rewards. I am married to Anne, a kindergarten teacher at Jefferson Elementary in Faribault, MN. I met Anne through a friend of mine who is her brother. We attended the same high school and would talk and pass notes to each other but never dated. We met again 10 years later when I was in chiropractic school and we hit it off. Two years later she asked me to be Santa Claus for her kindergarten class and I brought a surprise along, an engagement ring. She said yes and we were married in 2002. We have been blessed with 3 children, Mia Victoria born in 2003; Willie Cross born in 2005; and Kate Ava born in 2007. All are very healthy and have never received a vaccination or an antibiotic of any kind. They have been under chiropractic care since they were a few minutes old, and are adjusted on a regular basis. One of our favorite activities to do as a family is bike riding. Willie has been without training wheels since he was 3 and has been on the move ever since. 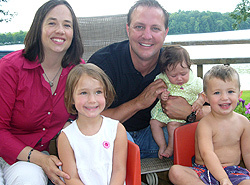 Dr. Steve Potter, his wife Anne and children, Mia, Willie and Kate. I am a sports fanatic. I enjoy golfing, volleyball, water & snow skiing, running, biking, camping, swimming, basketball, wrestling, football, everything. I love to watch the Vikings, Twins, and Timberwolves as well as the local high school athletics. I am on the board of directors for the wrestling club. Also actively involved on the board for HealthQuest, a local organization dedicated to the enrichment of the Faribault community in the betterment of health related issues. “Who’s your chiropractor?” is often asked. Yes, I have one. He is my cousin and he practices in Northfield, Mn, a short drive from my office. I personally get adjusted 2-3 times per month. I also try to increase my body’s performance by running 3 days per week, and lifting weights 2-3 days per week. I take supplements of a multivitamin, fish oils, probiotics and chondroitin/glucosamine. I am not a fan of vaccinations mainly due to the preservatives and additives that are present. I have chosen not to vaccinate my kids and I personally do not receive any vaccinations. Also, antibiotics have been shown to limit the body’s response to invaders. I see this as counterproductive. If my body has a reaction to something, I want my body to fight it off and build itself up stronger and allow it to withstand the next onslaught of disease. My body has the ability to regulate and has a terrific response to outside invaders by increasing my core temperature, or causing me to vomit; granted I may not feel well, but I know my body is working the way it was intended. However, I have not been sick for quite some time. My last cold was in 2004 and I have not had the flu. I have never missed a day of work for an illness. My nervous system is working at a very high level and I nourish it with proper nutrition, exercise, vitamins and especially with chiropractic care. I look forward to meeting you in person and learning how we may be of service to you. I have time to listen to you and work with you one on one so you can get the results you want. Most of my patients are referred by someone who has had terrific results in my office. Join us so we can help you take your first step towards better health.